Uploads of incidents via LTE in real time make this dash cam unique, but some key features are still in the works. Owl’s Car Cam is ground-breaking and uniquely capable, and it sports a wonderfully slick design that cherry-picks the best bits from the competition—and adds some soon-to-be-copied tricks of its own. But at $349, it’s also one of the most expensive dash cams I’ve ever tested, and it has some caveats. It currently depends upon the iPhone (6 or greater, iOS 11), as well as, to some extent, proximity to your vehicle. It’s also currently missing some key features that other, less expensive dash cams we've reviewed already have. The Owl Car Cam’s unique capability is its seamless, automatic, real-time LTE upload of accident/break-in images and video (interior and exterior, with its dual-camera system) to the company’s web portal, then down to your phone. Yup, if someone breaks into your car, their actions are going to be plastered all over the Internet as soon as you receive the alert and imagery. Smile, punk. Even better, if you’ve got good reception, you can watch live and tell them to “Make my day” using the camera’s speaker. Alas, while the Owl Car Cam is already shipping, it lacks Android support, HDR for the low-light video, and GPS watermarking. Purchasing an Owl involves a small leap of faith that the company will eventually implement these promised features. But trust me, what’s already implemented is well worth reading about. Out-of-box experience (OOBE) is important with the high-priced blends—it helps alleviate sticker shock/buyer’s remorse—and Owl nails it. No big-box-store, theft-proof plastic here: The product arrives in a high-grade, attractive box with a compartmented liner containing all the goodies, including thick-beveled, rubberized plastic cable ties. Luxurious, that. Owl’s design tricks with the Car Cam are even more impressive. The first bit of craftiness is taking advantage of the crevice where the window meets the dashboard as the location for the camera mount. A small, innocuous suction cup makes sure the whole deal stays put. It’s incredibly easy to set up, and the cable can be hidden in the crevice. You can vary the height of the camera by about eight inches using one of four variously sized mounts. The only caveats are that the mount tends to bounce just a bit, and the suction cup wants to stay attached to the windshield when you remove the mount. Not that you’ll need to do that often. There’s an extra clear-plastic cup in the box if your prefer it to the pre-attached black one. Because of the camera’s rather low position, it intrudes more into your field of view than a camera that's hidden behind your review mirror would, but it’s low enough and small enough that driver distraction shouldn’t be an issue. I soon forgot it was there, as it didn’t block my view to any degree that would test the “not obstructing” criteria here in California. You might want to check your state’s laws before installing any dash camera. But hey, if Formula 1 drivers can deal with the new Halo head protection, this is nothing. Tell that to CHP if they stop you and let me know if it works. The Owl sits within your field of view, but by using the shortest possible arm (several are included) it sits very low and could hardly be described as obstructing your vision of the road in most cases. Next up is a small stroke of genius: using your car’s OBD-II connector for a power source. All non-commercial vehicles since the ‘96 model year (except the Tesla Model 3), should have one. The OBD-II connector is also most often handily located underneath your dash, somewhere between the steering column and the door. 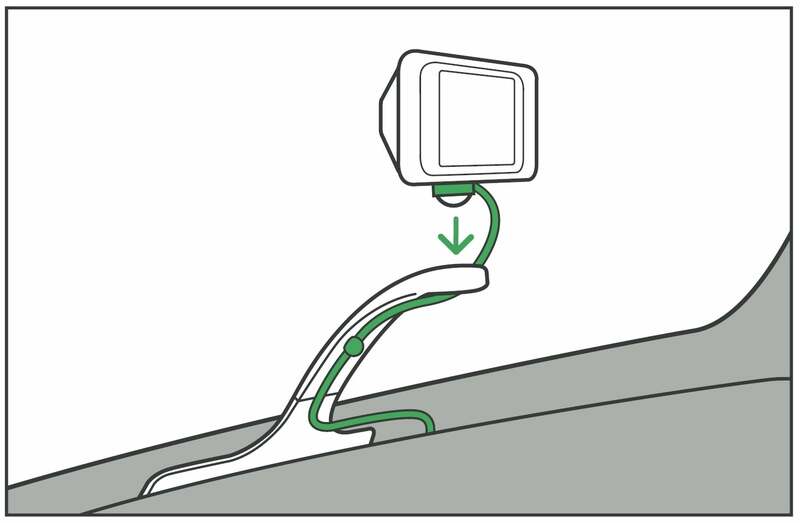 The cable from the camera can easily be hidden in the dash/window crevice and underneath the trim on its way to the connector. That said, the whole setup wasn’t nearly as inconspicuous with our second test vehicle, a 2001 Acura CL 3.2, whose OBD port is in the center console. Sigh. Using the OBD-II port might also inconvenience anyone already using it for metered insurance such as Metromile, or a Bluetooth OBD diagnostic module. If you need to use one those devices alongside the Owl, but you can purchase a splitter online for about $10. Regardless, for the vast majority of users this setup beats the heck out of using the cigarette lighter/aux connector. Then there’s the magnetic coupling for the camera, similar to the power coupling you’ll see on Macbooks and Surface tablets. The camera joins magnetically to the mount, and the power cable magnetically couples on both ends—to the camera and the OBD-II power adapter. I hate fiddling with cable connections in tight spaces, and this made attachment a breeze. This accident is faked, but it does show the intimate relationship between the Owl and the iPhone. Without the iPhone (Android soon), the Owl is basically useless. Finally, there’s the iPhone app and device pairing, which couldn’t be easier. Scan a code using the iPhone camera to download the app, then use the app to scan a code displayed on the Car Cam to pair it (using Bluetooth Low Energy 4.2), and you’re done. Really. The LTE connects automatically, and everything is fully functional. It’s quite cool. You can also use the app to turn the interior camera on or off, and increase or decrease screen brightness, speaker volume, and the sensitivity of the G-sensor and view video, which I’ll get into more detail about later. Some functions, such as the interior camera on/off, and taking a quick incident video, can also be invoked using the touchscreen. 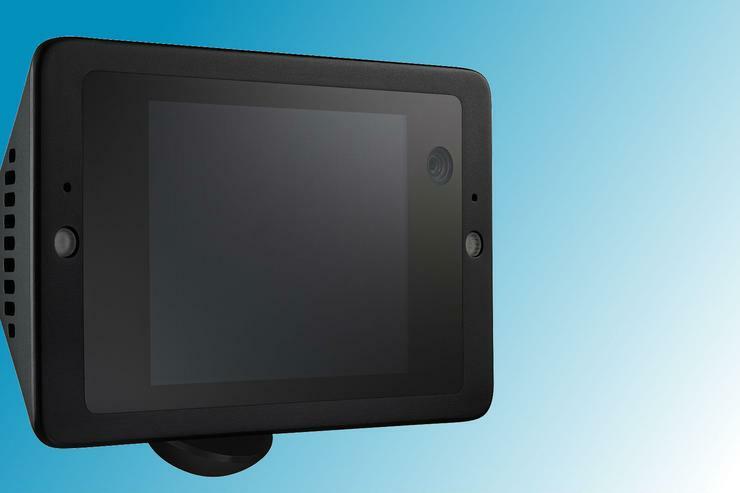 The Car Cam has integrated GPS (a limited implementation at the moment), and of course a gravity sensor, as well as dual-array microphones on either side of the 2.4-inch color touchscreen LCD. There are two cameras: a front-facing 4MP (1440p) unit and a rear-facing 1MP (720p) interior unit. Both cameras sport a 120-degree FOV (Field of View) which is on the narrow side, but fine for the unit’s center placement. When in “guard” mode (while parked and unattended), resolution on both cameras drops to a juice-saving 480p for the constant surveillance. That’s also the resolution for live view shown in the app. Yes, as I said up top, you can take a look from just about anywhere at what’s going on in and about your car. The cameras jump back up to their full resolution for incidents, and the unit will automatically shut off after 24 hours, or when it senses a drop in the battery of about 5%. The 24-hour shutoff is a bit of an issue for me, as I often leave my car parked here in San Francisco on the street unattended for a good deal longer than that. I wish it were longer, but it’s better than a dead battery. 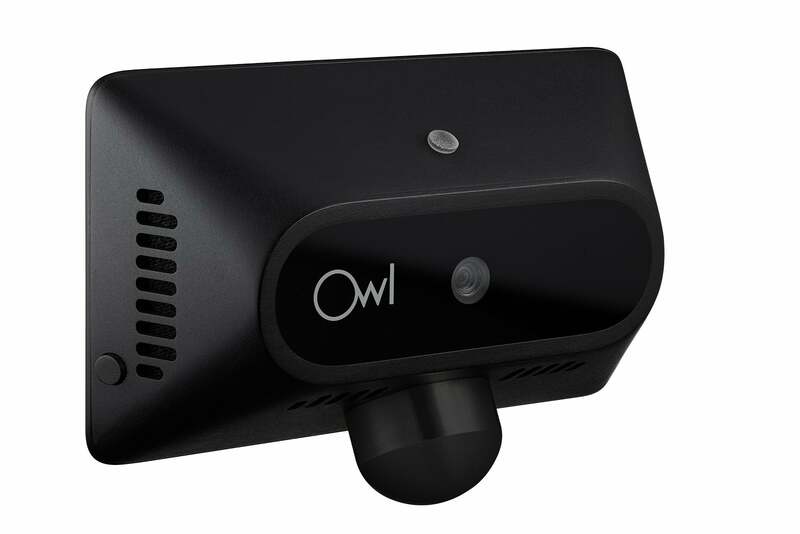 The Owl Car Cam contains enough internal memory to store 12 hours of non-stop driving video. After 24 hours or when the Owl runs out of room, non-incident video is erased on a first-in, first-gone basis. In other words, you’ll always have the most recent 12 hours of driving. As there’s no SD card slot or USB port, offloads are to your iPhone via the LTE for clips, and to the phone via 802.11 Wi-Fi for the continuous video. The latter connection occurs automatically when you select Last 24 (video from the last 24 hours) in the app. All you need do is click/tap past an Allow/Don’t allow dialog. No need to search for a Wi-Fi hotspot, as with other dash cams. More cleverness. There’s no USB or SD card, but there is a green warning light as well as two micro LED floods that come on at night in the case of a break-in. 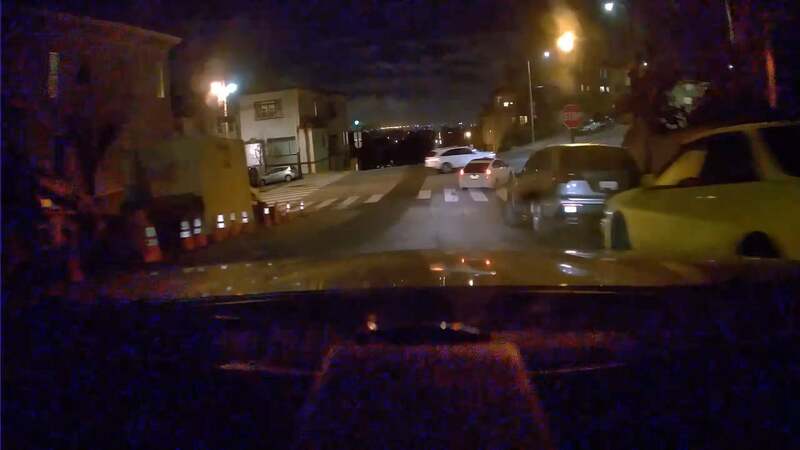 A green light on the back of the Owl Car Cam flashes to let possible perpetrators know the car is being protected (assuming they’re intelligent enough to divine the intent), as well as two white LEDs that switch on if intrusion is detected. Intrusion is considered any opening of the car where the camera doesn’t detect your iPhone via its Bluetooth link. The operating temperatures are pretty sane compared to those claimed by some companies: -4 to 120 degrees Fahrenheit. If the camera senses an out-of-bounds temperature, it shuts off. Turn the heat or the AC on when you’re driving as you normally would, and you should be fine. Non-operating temperatures should do for just about anywhere: -40 to 175 degrees Fahrenheit. Using the Owl Car Cam is very easy, though you need to be near the camera, i.e., in the car, for offloading the non-incident video, as there’s no easy way to power the unit outside the vehicle. The Owl Car Cam automatically creates incident videos when the G-sensor feels an impact or the camera senses motion nearby (these aren’t uploaded unless intrusion is detected), or the car powers on and your phone isn’t present. But you can create your own 20-second clips by simply uttering “Okay presto.” Even better, you can title the clip by continuing with a phrase such as, “Jerk who should lose his license.” If there’s too long of a pause, the video remains untitled. You can also take a clip by tapping the touch display. Alas, all the cleverness and ease of use in the world won’t help a dash cam if it doesn’t take good video. The Owl Car Cam was excellent during the day, as smooth and detailed as I’ve seen and possibly more so. Please note that the small blur on the van, just beyond the stop light to the right, in the screen capture below, is from a recent ding (small crack) in my windshield—it’s not a fault with the Owl Car Cam. 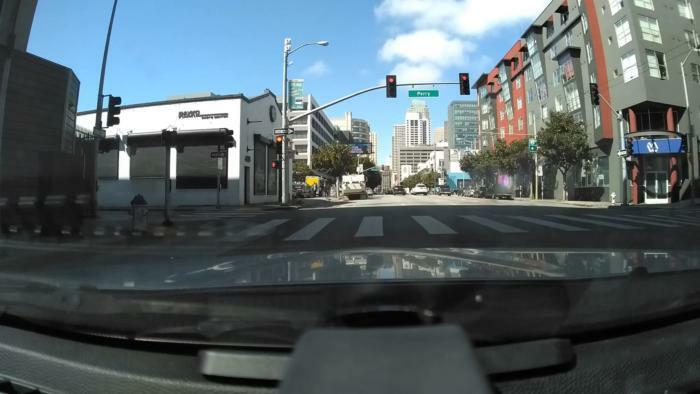 The Owl Car Cam’s daylight video is excellent. It’s also aces in a well-lit environment like a parking garage. Note that the blur on the back of the van is a windshield defect, not the Owl Car Cam. Night captures in city-light conditions was also very good There’s wasn’t a lot of lens flare from headlights and the like, and much of my testing was in foggy, rainy conditions. Please allow for that when viewing the night captures you see below. However, in low-light conditions details were indistinct and very grainy. Interior low-light, night captures didn’t reveal a lot of detail either, though they weren’t as grainy. The twin LEDs which fire up helped tremendously so those captures should be more than adequate for legal purposes. 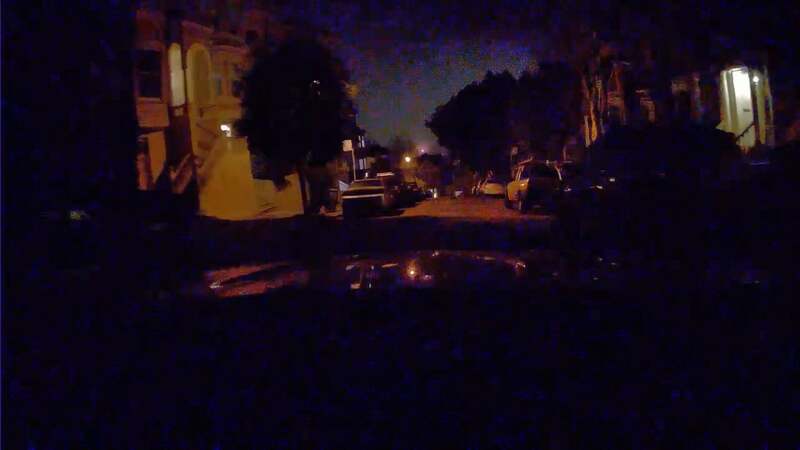 Put in practical terms, the Owl Car Cam is great during the day, and in decently lit night surroundings. But if you’re parking where there are no street lights, it’s currently not even close that that of some of the cameras we’ve seen recently with Sony’s latest STARVIS sensors. Read our BlackVue DR750S-2CH and Vava Dash Cam reviews for more on those. Owl wouldn’t name the sensors used in the Car Cam, but from a previous conversation, I know they are not STARVIS. Hence, whether the sensors employed in the Owl’s Car Cam are capable of that kind of low-light performance, I can’t say. We’ll see when the night HDR arrives. With headlights on, the Owl Car Cam does much better at night. Please note that it was a rainy, moist night in San Francisco, and most of the distortion is from rain and a small defect in the windshield. Low light isn’t currently the Owl Car Cam’s best friend. HDR to address this is said to be in the works. Note that even without headlights, this is relatively well-lit compared to some suburban and rural locations. You’ll notice that there’s no GPS info shown on any of these captures. It’s on the roadmap (no date was given), but watermarking is not currently available. GPS info has become a standard dash cam feature and goes a long way toward defeating any “well, it may look like me, but it isn’t me” arguments. Not having it is a definite drawback. Alas, the LTE upload feature isn’t cheap. While your initial $349 investment includes one year of uploads to Owl’s video service, subsequently they’ll cost you $120 a year. You can use the Owl without the service by simply uploading video to your phone, but the incident uploads are the main attraction. If you think of it as adding a cheap additional line to your existing cell service, you’ll feel better. Additionally, the Live View and clip uploads (voice command or g-sensor) are limited to 60 incidents, or 60 minutes per month. I’m figuring most drivers won’t touch that. I really had to work (finding potholes) to get the G-sensor to sense an impact with the sensitivity set to the default 50%, and my car is set up for light track use (in other words, its suspension is stiff and picks up a lot of road feel). All that aside, should the need arise, you can get another 60 minutes for $10 if you’re collision-prone, or drunks stumble into your car nightly. Note that the LTE is via AT&T. AT&T was once known for its coverage in the boonies, but it places a distant second behind Verizon. Carrier options would’ve been nice for those occupying the country’s hinterlands. I should also point out that because the entire system (other than offloading video) relies upon wireless technologies, performance depends on that. It worked well for me, but I live in the middle of San Francisco. I did puzzle over a couple of omissions. An internal battery would for allow the GPS to remain active for tracking thieves (just an idea), and more importantly, extend the run time well past 24 hours. The Vava Dash Cam will run for a solid three days off of its internal battery, though it’s powering less hardware. Also, a USB port would allow you to retrieve continuous video off the camera far faster. Currently, you must eyeball the video using the app and can retrieve 30-second, 5-minute, or 10-minute clips. The latter two weren’t working at the time I tested the Owl, though a fix was promised. For most scenarios, ten minutes should be adequate, but there should be an option to dump all of it for editing on a larger platform than a phone. The Owl Car Cam is currently not the easiest camera for documenting your travels, or the track days I use my VaVa or Thinkware X500 to record. 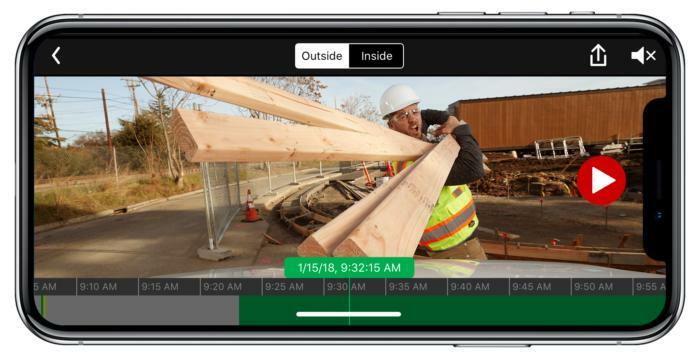 Just to clarify: An iPhone 6 or better with iOS 11 are required because the Owl Car Cam relies on the HEVC (h.265) codec, which only the latest version of iOS understands, and only later iPhones have the horsepower to play back smoothly. The Owl app did work with an iPhone 5S we tried, but it was slow. What Owl has done for the dash cam concept and design is remarkable. The extremely clever and thoughtful design, and supremely easy setup and use, are all best-of-breed. And as far as I’m aware, it’s the only 24-hour, in-car surveillance solution available to consumers. That alone has redefined the genre. But even if it’s already functional under most circumstances, the lack of important features is notable for a product this expensive. We'll hen it’s feature-complete, and we hope and assume that will be soon, we’ll be back with a rating and a final opinion.